John K Stuff: Sign Up Now! Maybe you could be the next Art Clokey! 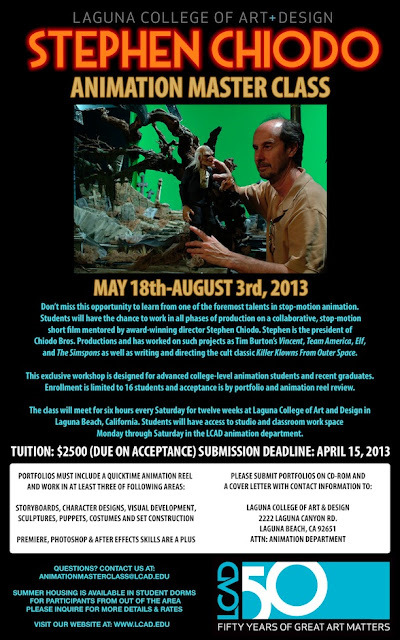 Laguna College of Art and Design is proud to announce the Animation Master Class for Summer 2013 featuring Stephen Chiodo. This workshop will be held for 12 consecutive Saturdays at the Animation Department of LCAD in Laguna Beach, California from May 18th-August 3rd. Sixteen students will have the opportunity to work on all phases of a stop-motion animated short film mentored by award-winning director and animator Stephen Chiodo whose credits include Tim Burton's Vincent, Team America, Elf, The Simpsons and the cult classic Killer Klowns from Outer Space.